Last week, I wrote about color-coding elaboration strategies. Over the course of the week, several teachers asked me about this lesson and I had the chance to teach it in two separate classrooms on Friday and today. One of the perks of my job is that I get to teach the same lesson to different classrooms and adjust it if I think that it could be better. The first time, I co-taught the lesson with one of our teachers and we had students divide into teams to elaborate my skeleton story: I arrived at the beach. I wanted to learn to ride a wave. I rode a wave right in to the beach! One team worked on description, one team worked on dialogue, one on action, and one on inner thought. On that day, I scribed their work on to the chart in between the three original sentences, using different colors to signify different elaboration strategies. Both of us thought the lesson went well and students were definitely using the various strategies during the workshop, but I thought that the scribing took longer than it should have. When I taught the lesson a second time, I brought colored strips of paper. The teaching point is on the chart below, and I left room so that the classroom teacher can write more under each strategy if she wants to. After showing them the chart and establishing the teaching point, we divided the students into teams and gave each team several strips of the same colored paper: red for action, blue for description, green for dialogue, and purple for inner thinking. Once they wrote their strips, we taped them up into the appropriate places on the chart paper and watched the story get better and better. We added inner thinking last so that they could see how much depth thoughts add to stories. The three main sentences are: I arrived at the beach. I wanted to learn to ride a wave. I rode a wave in to the shore. During the workshop, most of the students were working hard to try out different strategies. At the very least, they were more aware of what they could work on. I can't wait to hear more about how they continue to use these strategies. Is Listening the Lost Standard? Last week, I attended the Connecticut Forum to listen to Charles Blow, Karl Rove and Doris Kearns Goodwin debate and discuss what is wrong with our current political system. They were supposed to, according to the program, discuss how to fix it, but most of the agreement was only on the fact that our political system is broken. I came away from the night worried about the political future that my daughters face, and believing that one of the most important standards in the Common Core is the one that has to do with listening. Really listening. Not waiting to have a turn to talk, but engaging in conversation that strengthens or weakens previously held beliefs. Digging into the speaking and listening standards, the one that I'm not sure that Charles Blow and Karl Rove have mastered is the first anchor standard for Speaking and Listening: Prepare for and participate effectively in a range of conversations and collaborations with diverse partners, building on others' ideas and expressing their own clearly and persuasively. They seemed much more interested in listening to each other in order to gather ammunition and discount the other, as opposed to listening to each other in order to build on ideas. By the end of third grade, students should be able to explain their own ideas and understanding in light of the discussion. By the end of eighth grade, they should be able to acknowledge new information expressed by others, and, when warranted, qualify or justify their own views in light of the evidence presented. And, by the time they graduate, students should be able to respond thoughtfully to diverse perspectives; synthesize comments, claims, and evidence made on all sides of an issue; resolve contradictions when possible; and determine what additional information or research is required to deepen the investigation or complete the task. I am working on some thinking stems that emphasize the integration of opposing ideas. I may also add books that emphasize listening skills to classroom libraries, but books that go beyond sitting and crossing legs, and into the integration of ideas and knowledge. I'd love some suggestions! As a parent and as an educator, I believe in democracy and the importance of it. I want my children to grow up into a country where leaders listen and learn from each other. Tomorrow, I will be meeting with some teachers to talk about ways that they can help students understand how to elaborate their narrative stories. Since many of the teachers in our district are working on teaching elaboration, I was sifting through some favorite posts. Last year, Anna Gratz Cockerille wrote a post about toolkits and included a chart showing the balance between action, dialogue, and thinking. I have also added description, and I have created a skeleton story, sequentially adding an elaboration strategy. I envision unfolding this story to students, gradually showing them the impact of adding carious strategies. I have color coded the strategies so that it's easier to spot the differences. One day, I went to the beach. I wanted to learn how to ride a wave. A big wave came along and I dove through it. One day, I went to the beach. I wanted to learn how to ride a wave. All around me, people were frolicking in the water. I watched three kids who looked to be my age run and jump through the crashing waves over and over. A big wave came along and I dove through it. When I came up, the wave was rolling into the beach and my mom was standing and clapping. The three kids I had been watching were also clapping. One day, I went to the beach. I wanted to learn how to ride a wave. All around me, people were frolicking in the water. I watched three kids who looked to be my age run and jump through the crashing waves over and over. I walked down to the water’s edge and watched the three kids a little while longer. Curling my toes into the sand, I started talking to myself. She got up and walked closer to the water’s edge. Then, I walked right into that ocean and into those waves. All of a sudden, a huge wave came up.A big wave came along and I dove through it. I put my arms over my head and sucked in a huge breath of air. Then, just as the wave broke, I dove. I bent my knees and went head down right into that wave! When I came up, the wave was rolling into the beach and my mom was standing and clapping. The three kids I had been watching were also clapping. One of them came over and gave me high five. “Be careful,” my mom called. “The waves are really big,” Mom said from her chair. She got up and walked closer to the water’s edge. “I know,” I said. Then, I walked right into that ocean and into those waves. All of a sudden, a huge wave came up. A big wave came along and I dove through it. I put my arms over my head and sucked in a huge breath of air. Then, just as the wave broke, I dove. I bent my knees and went head down right into that wave! When I came up, the wave was rolling into the beach and my mom was standing and clapping. The three kids I had been watching were also clapping. One of them came over and gave me high five. “Do you want to body surf with us?” he asked. One day, I went to the beach. I wanted to learn how to ride a wave. Maybe this will be the day, I thought to myself. All around me, people were frolicking in the water. I watched three kids who looked to be my age run and jump through the crashing waves over and over. How did they do it, I wondered. How did they just dive right through those waves. They are not scared at all. You can do this, I said to myself. You definitely can do this. But in the inside, I wasn’t sure. All of a sudden, a huge wave came up. I was scared. I knew that I had to time it perfectly or I could get really hurt. What if I missed? What if the wave crashed right over my head and spun me around? What if it...no more time for what if’s! A big wave came along and I dove through it. I put my arms over my head and sucked in a huge breath of air. Then, just as the wave broke, I dove. I bent my knees and went head down right into that wave! When I came up, the wave was rolling into the beach and my mom was standing and clapping. The three kids I had been watching were also clapping. One of them came over and gave me high five. I had done it! I felt like I could do anything since I had finally figured out how to dive through a wave. Feel free to use these samples or tweak them as you see fit, but I'd love to hear if anyone experiences successes or if anyone has other ideas for helping elementary students develop elaboration skills. A few years ago, I read Mindset by Carol Dweck and it completely lifted the level of my thinking as an educator and learner. I immediately wanted to teach the concept to my students that year and make them aware of their mindsets as learners. 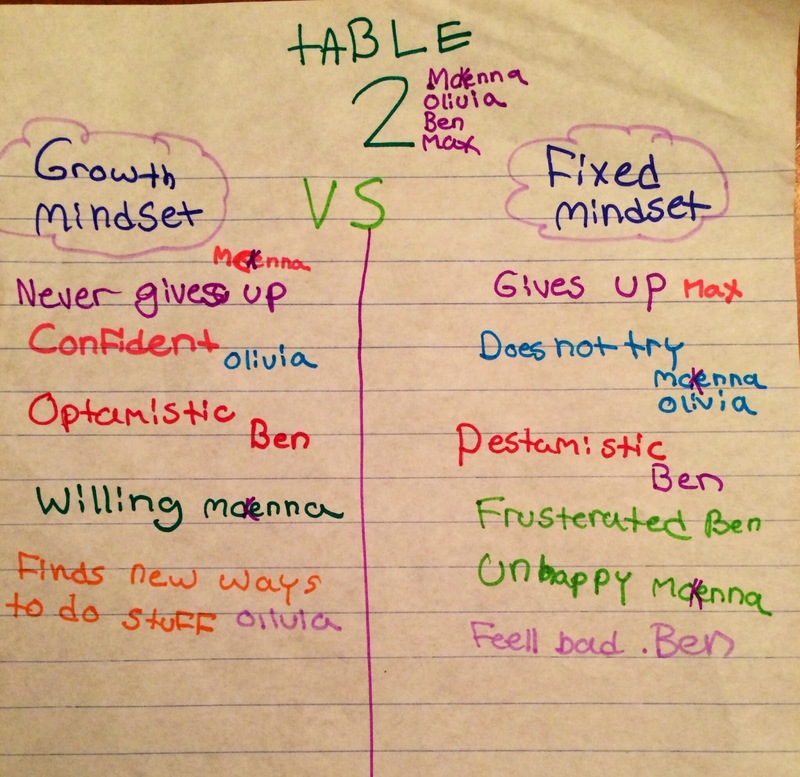 To read all of my posts I wrote about mindset and teaching students about the difference between a growth mindset and fixed mindset, click here. To read my post that describes the difference between the two mindsets and my first introduction to students about the concept, click here. Ever since I read Mindset by Carol Dweck and read additional books about the concept, I always introduce the concept to students during the first week of school through read alouds. We read picture books with characters who demonstrate perseverance, along with characters who may want to give up at the beginning, but then realize they CAN do it in the end. I always read The Dot on the first day of school to begin these important conversations by talking about Vashti and noticing how she didn't think she could draw at the beginning, had little confidence in herself, and became very frustrated. 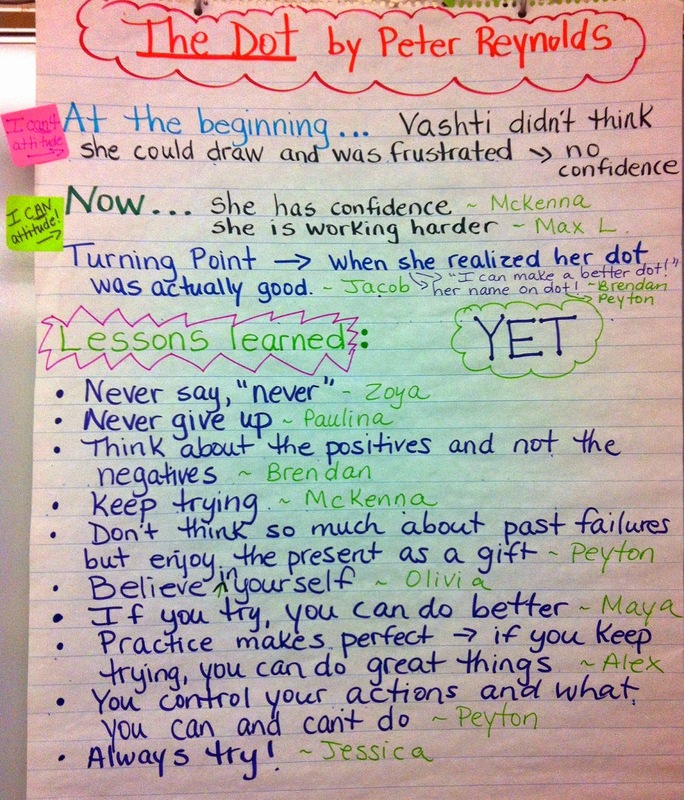 Then we discuss how Vashti changed at the end and began to work harder and built up confidence in herself as an artist. This discussion leads us to the power of the word YET and how when we can't do something, we should say, "I can't do this YET" instead of "I can't do this." See our class chart below for The Dot by Peter Reynolds. In addition to The Dot, I also read aloud a new book, The Magnificent Thing by Ashley Spires, that I came across this past summer. This is a perfect picture book to read aloud to discuss perseverance - what it looks like and sounds like. It also reinforces that making mistakes and failing is part of the learning process and that you should keep trying and put in 100% effort into your goals and dreams. In this book, the character has an idea that she wants to make something magnificent, but each time she tries it doesn't come out the way she pictures it in her mind. Even though she continues to fail multiple times, she keeps on trying. Even though she still gets frustrated and thinks for a second that she should just give up, she doesn't. 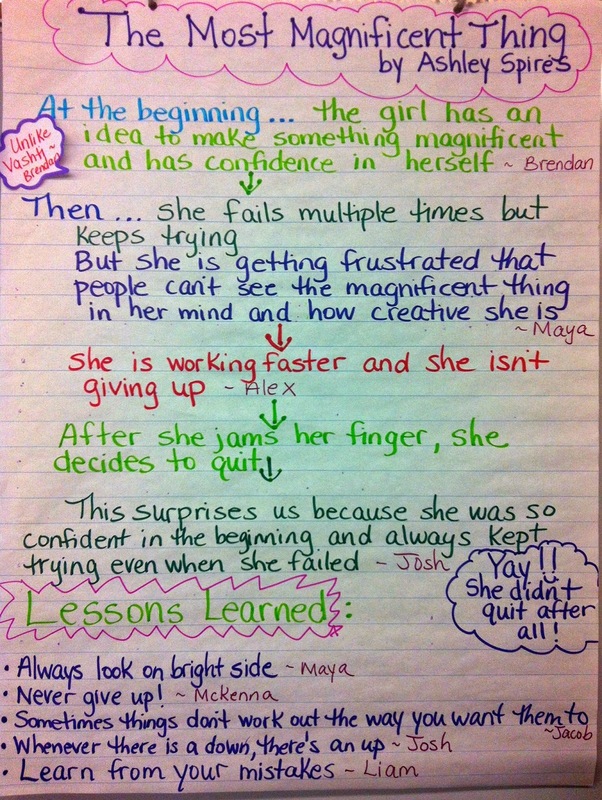 This is a powerful read aloud to discuss perseverance and growth mindset. After groups have time to discuss the differences between the two mindsets and jot down their thinking, we share ideas as a whole class. 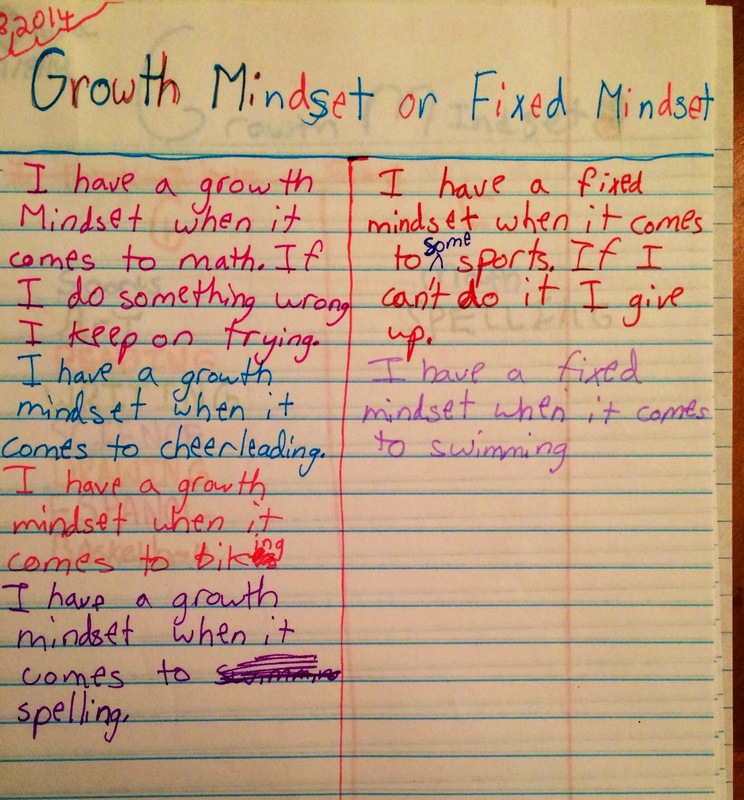 Below are two charts we created to compile the students' thinking about the two mindsets. 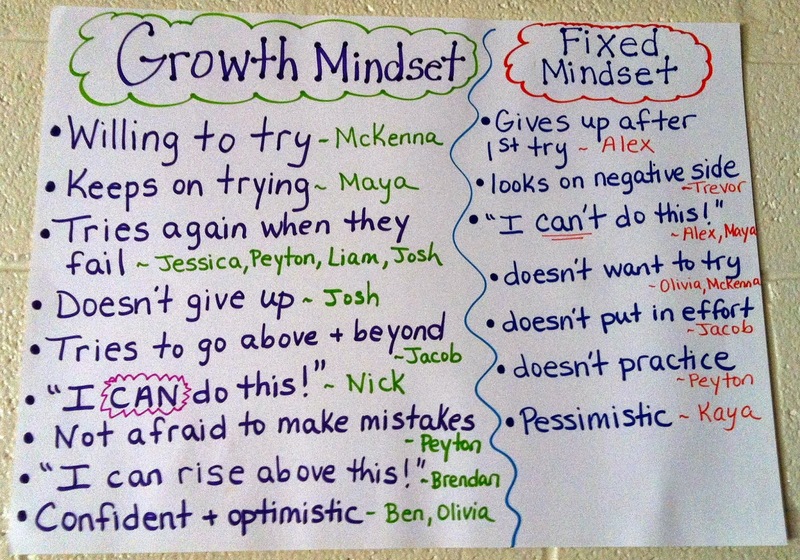 The first chart is our draft that I jotted quickly as students shared out, and the second is the one we have hanging up above our smartboard in the front of the class as a reminder to strive to have a growth mindset as learners. 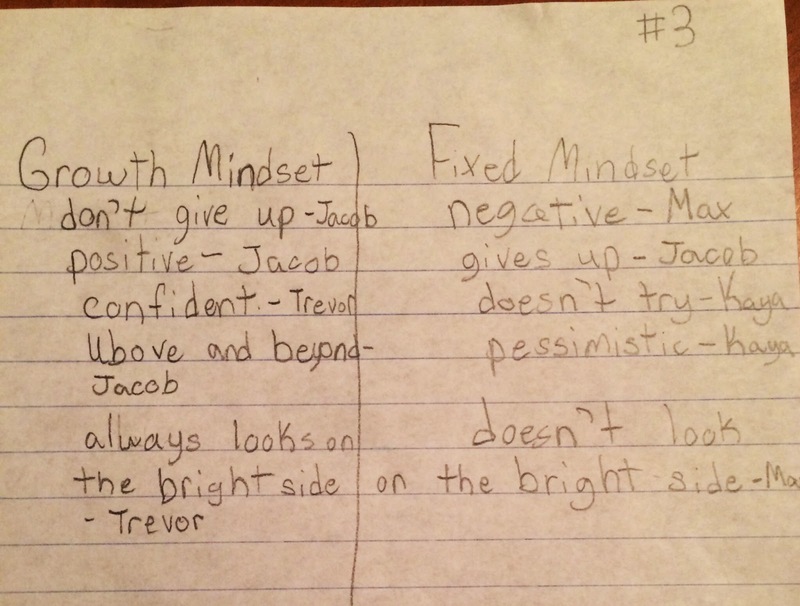 During the second week of school, once students have discussed the concept of the mindsets and have an understanding between the two, I have students write a personal reflection about their own mindset. 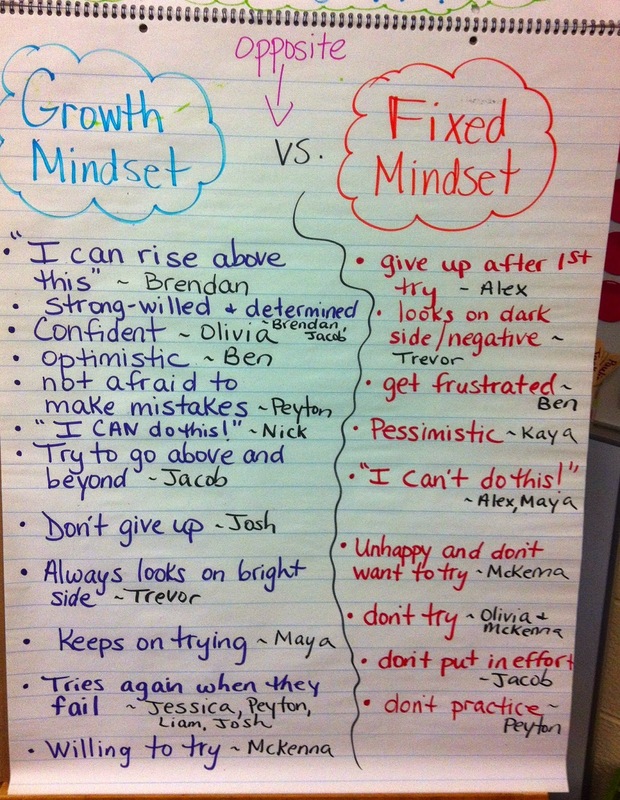 We talk about how it is possible to have a growth mindset in one area and a fixed mindset in another. For example, you may have a growth mindset in reading and writing, but a fixed mindset in math. Or you may have a growth mindset while playing sports, but a fixed mindset when it comes to school. 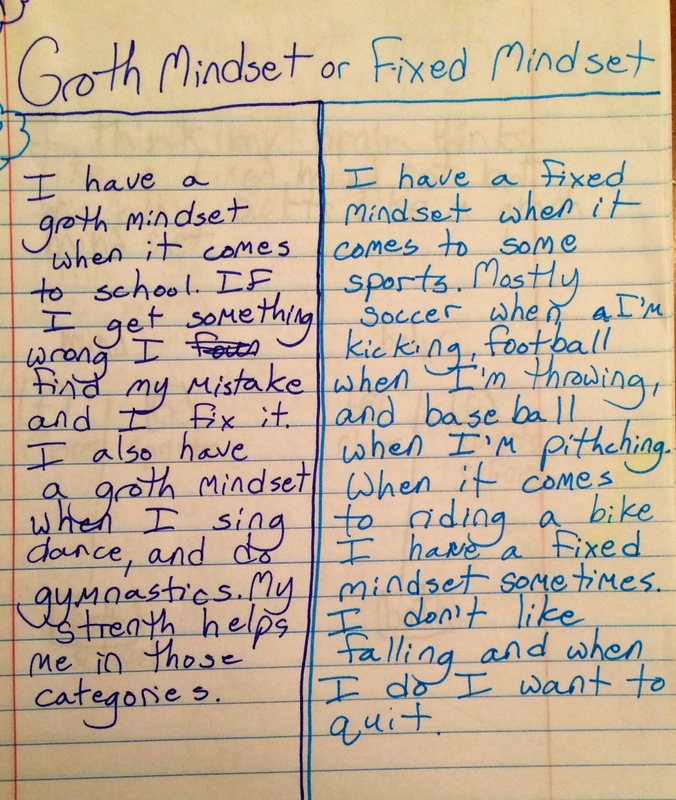 Below are two examples of personal reflections that students wrote about their mindsets as learners. Students will continue to write personal reflections about their mindset throughout the school year and at the end of the school year they will compare their reflections to see how their mindset has changed throughout the course of the year. In addition to conversations and reflections, we also consistently talk about mindset during our read alouds throughout the year. 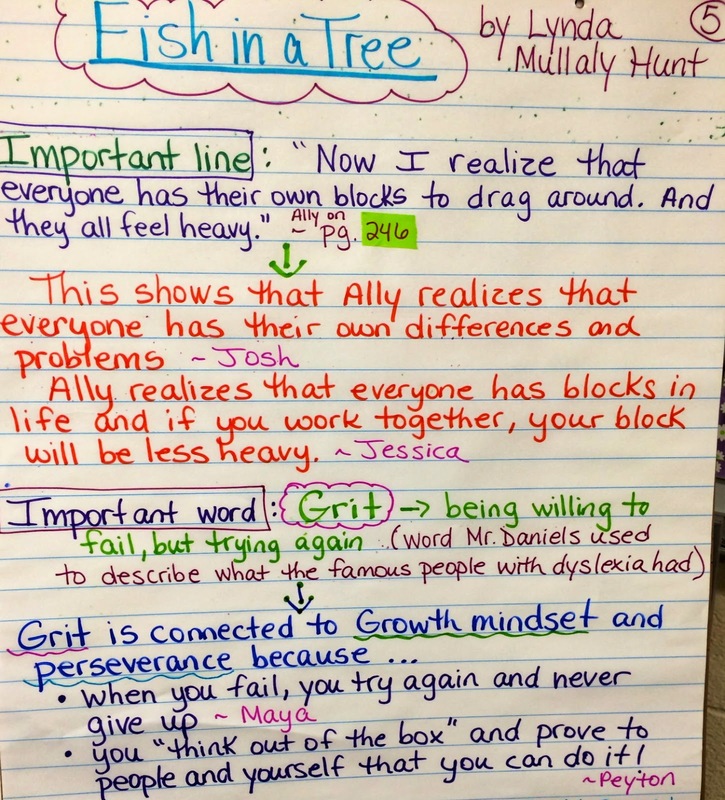 For example, this week we are finishing our first chapter book read aloud, Fish in a Tree by Lynda Mullaly Hunt, and students have shared their thinking about the characters' mindsets and noticed the word "Grit" that Mr. Daniels used and how it is connected to growth mindset and perseverance. Below is one of our 5 charts we created during our read aloud for Fish in a Tree that shows some students' thinking about mindset. If you have not read Mindset by Carol Dweck yet, I highly recommend that you add it to the top of your stack to read. Ever since I read it a few years ago and began teaching and discussing the concept of mindset with my students, I have noticed the positive impact it has on my students as learners and individuals.